Yoga goes Windows. We're about to take a look at the Windows version of the ergonomic acrobat that is the Yoga 2. We've got a lot of questions: Did Lenovo equip this tablet with the same great IPS panel? How's the battery life compared to the Android model's? Are there any hardware updates? Read our review to find out what we discovered. Overall we found the tablet to perform very well and applications worked flawlessly. It definitely felt like an adequately powered tablet, which is something that you can't always say about tablets. Battery life clocked in at around 9.5 hours. Model: Lenovo has been always a reputable company with decent price for their products and a good after sales service. The Lenovo Yoga 2 is a notebook designed to be a more different notebook. Rather than having the standard form factor of a notebook the Lenovo Yoga 2 has a removable keyboard and a touchscreen. Making it to be more like a tablet than a notebook. Compared to typical tablets, the Lenovo Yoga 2 might have slimmer design. The cylindrical battery doubles as a display stand rotating out. The LCD touchscreen has a size of 10.1 inch and a resolution of 1920 x 1200 pixels and uses IPS technology. It is a very nice and sharp display. The rear camera has a resolution of 8 MP (3264 x 2448 pixels) and there is 1.6 MP front camera. The hardware consist of an Intel Atom Z3745 quad core processor clocked at 1330 MHz, 2048 MB (2GB) of RAM, an Intel HD Graphics (Bay Trail), 32 GB of built in storage and a MicroSD card slot, which supports up to 64 GB. This Windows 8.1 system is quite reasonable for everyday tasks, but it is not apt for gaming. The battery life is fairly decent with its lithium polymer battery with a capacity of 9600 mAh. 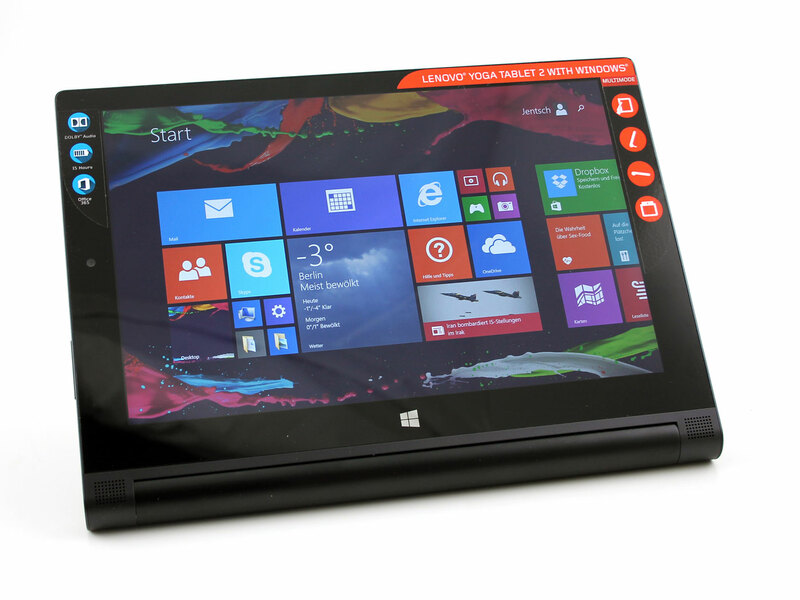 The Yoga 2 lasts about 24 hours while idle and 15 hours in WLAN mode. The weight of the unit comes at only 630 g (without the keyboard). Speaking of the keyboard, it's a Bluetooth keyboard (magnet connection) with chiclet style keys. It relies on the hinge mechanism of the display to stand up right. The available ports are a micro HDMI port, a 3.5 mm headphones jack and a micro USB 2.0 port. The Lenovo Yoga 2-1051F is suitable for those who want a more portable notebook and need more than what a tablet can do.